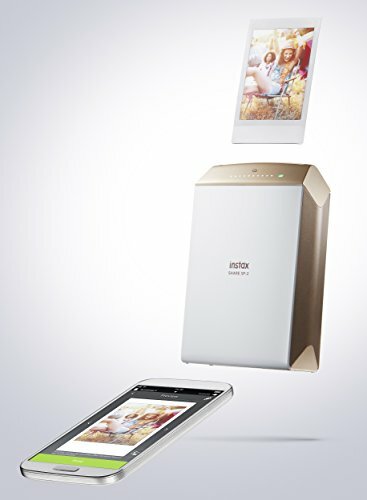 • Brand: Fujifilm (INSTAX SHARE SP-2 GOLD)..
• Mini Fast-Speed Photo Printer for Mobile Smart Devices..
• Powered by rechargeable battery. Chargeable via micro USB port..
• Up to ninety minutes charging time..
• Quick printing from your smartphones and tablets in ten seconds..
• Comes with free Instax(R) Share app for Android(TM) and iOS(TM) mobile gadgets..
• Create high-resolution photos by sending images from your smart devices using the free SHARE app..
• Produces pictures with detailed gradations, facial expressions, characters and clear objects..
• Equipped with laser exposure system for faster printing..
• Resolution: 800 x 600 pixel images with 320 dpi..
• 256 levels per color (RGB)..
• Image size: 2.4 x 1.8 Inches..
• Features reprint button for printing additional copies..
• Different photo template options..
• You can instantly upload your pics to social networking sites..
• Supports Wi-Fi connection.. Able to print images from online media sites..
• Indicator LED lights for displaying film and battery status..
• Overall product dimension: 7.1 x 5 x 3 inches..